There's no shortage of earbuds on the market. Some offer great sound but are uncomfortable; others are lightweight but have wires that get in your way. And, if you find a set that’s perfect, they tend to cost an arm and a leg—unless you're looking at AirTaps True Wireless Earbuds. They offer features that you’d only find in expensive earbuds but, at just $36.99, are far more economical. AirTaps Wireless Bluetooth Earbuds offer elite level features at a bargain bin price. They produce powerful Bluetooth sound, are lightweight enough to be worn comfortably for long periods, and they’re completely wireless so you can wear them through any activity. Combine these specifications with Bluetooth 4.2 technology, a waterproof design, and long battery life and you’ve got a set of earbuds that’ll satisfy virtually every need. What's more, they come with a portable charging case that can recharge them up to 10 extra times. Whether you've got a long commute or like working out to music, AirTaps Wireless Bluetooth Earbuds could be your best listening solution. Save 62% on a pair AirTaps Wireless Bluetooth Earbuds right now and pay just $36.99. 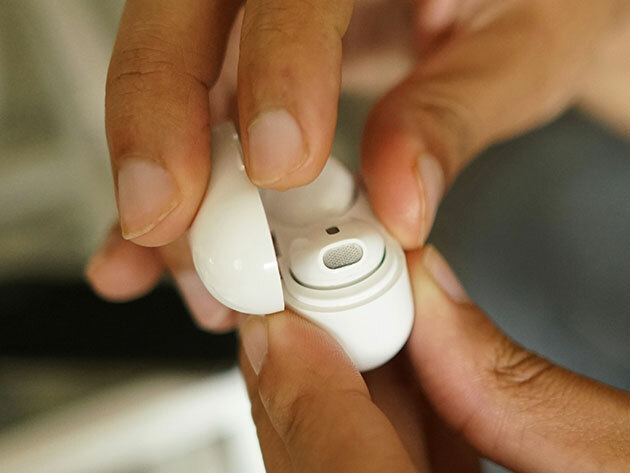 This story, "Get These $100 AirPod Alternatives For Just $37 Today" was originally published by PCWorld.